To meet the SEPA requirements of our clients, Equens decided to select and implement an entirely new Acquiring Platform. After an extensive process, we selected OpenWay's software package WAY4. To meet the SEPA requirements of our clients, Equens decided to select and implement an entirely new Acquiring Platform. After an extensive process, we selected OpenWay's software package WAY4. WAY4 will be incorporated into the Equens' cards processing as part of the SEPA Cards Programme by 1 September 2008. The software enables Equens to reduce costs and realise a faster time-to-market for new functionalities and the introduction of new international brands. Equens selected Fujitsu for the required infrastructure on account of its specific knowledge and experience in this field. Moreover, Fujitsu offers a flexible, scalable solution, which is essential for Equens due to the expected volume growth. 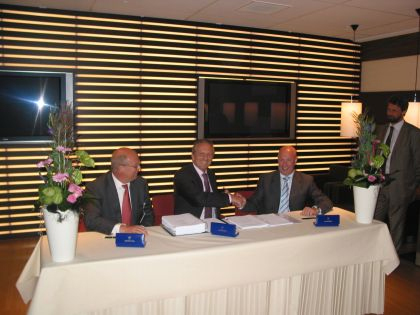 The signing ceremony took place in the Globe at Equens headquarters in Utrecht. In the presence of representatives of OpenWay, Fujitsu and the project members of the SEPA Cards Programme, on behalf of the BoD Antoon Kuijpers signed the agreements. He especially thanked the project members for their contributions and constructive cooperation. One of the top Acquiring Processors in EU. One of the most innovative processors. 500.000+ Merchants. 7 billion payments. 1.9 billion POS and ATM auth transactions. 10% EU market. 260,000+ revenue in 2006. 1,300 staff.